Another truckload leaves Decatur...this time filled with toiletries for Believe in Tomorrow, thanks to the leadership of senior Connections and National Honor Society member, Jude Al-Hamad. When Stephen Decatur High School senior Samantha Stephan watched her three year old cousin battle childhood leukemia, she knew that she wanted to do something to help the thousands of families who visit St. Jude's Research Hospital every year. That calling came in the form of a toy drive for children, from infancy to age 19. The end result was the collection of eleven cases of various gifts collected in just three week's time. Stephan, who is a member of both the service organization, Connections, and the National Honor Society, advertised the drive throughout the school and was delighted by the response. 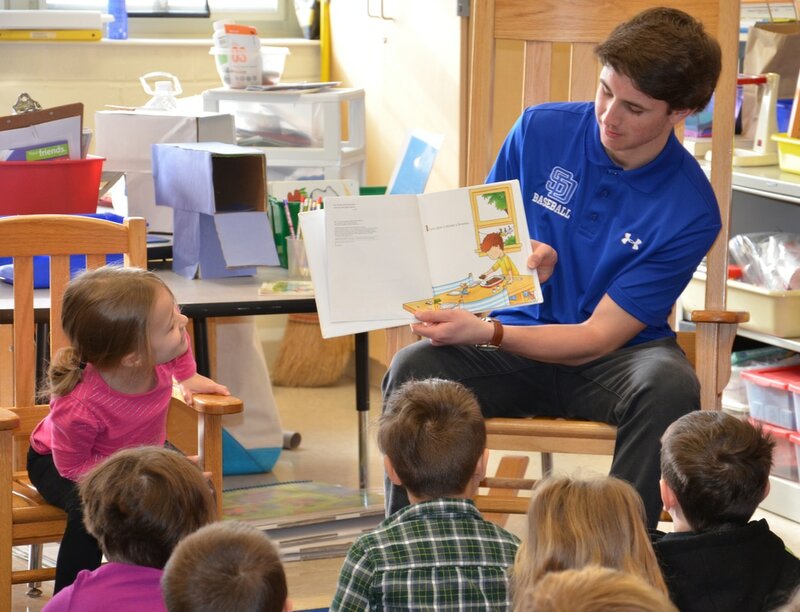 "It was so great to see so many students contribute to such a worthy cause. Some classes even did collections to go out and shop for toys," Stephan said. Toys were specifically chosen per the medical conditions of the children from a prescribed list. The bountiful collection will be picked up by trucks sent by the Childhood Cancer Family Fund, which is, according to its website, "a nonprofit organization focused on providing Christmas gifts to pediatric cancer patients at St. Jude Hospital's Target House long term family residence." Stephan and Connections advisor, Laurie Chetelat, are hoping to continue the initiative each year, given its overwhelming success. A brainchild of senior Connections member Kaitlyn Peters, the Pajama Project has grown steadily over the past four years. The donations, along with matched donations from Scholastic Books, go to Diakonia. Senior Dana Kim has scored in the top one percent of more than 1.6 million students who took the Preliminary SAT/National Merit Scholarship Qualifying Test, earning the distinction of semi-finalist. Kim will now submit a detailed scholarship application that includes information about her academic record, participation in school and community activities, demonstrated leadership abilities, employment, and honors and awards received. National Merit Scholarship winners will be announced beginning in April 2019. 12 years, nearly 115,000 hours of service, over a decade of incredible service-oriented students. This year, over 60 Stephen Decatur High School students received the Presidential Service Award for community service, including five gold recipients who volunteered over 250 hours. SDHS students logged over 11,000 volunteer hours this past school year. Superintendent Louis Taylor (SDHS Class of 1978) served as the guest speaker. In a language rich and scholarly ceremony, eighteen Stephen Decatur High School students were inducted into the National English Honor Society (NEHS) on September 25. Stephen Decatur High School drama teacher Brandon Cater served as the guest speaker while officers, Marissa Wheaton and Tara Fischer, emceed the event. The SDHS chapter of the NEHS runs the Seahawk Writing Center as well as conducts a book drive each year. After a school-wide vote, donning the title of 2018 Homecoming King and Queen are seniors Steven Bise and Danasia Wright. It was a chilly fall day, but that did not deter a small group of students from assisting emergency responders and Atlantic General Hospital medical personnel during a mock accident drill involving a decontamination unit. Students feigned injuries and underwent the process of decontamination so that AGH and other stakeholders could evaluate the process. Group picture: Back row: Gary Briddell, Neah Purnell, Hattie Brous, Zainab Mirza, Lydia Hobbs, Xan Johnston. Front row: Mikail Randall, Tucker Cordial, and Brett Berquist. Fifty-two Stephen Decatur High School Advanced Placement students earned special College Board distinctions following the 2017-2018 school year including one student who earned national recognition. The College Board AP Program recognizes high school students who have demonstrated outstanding college-level achievement through AP courses and exams. The four distinctions include: AP Scholar (granted to students who receive scores of 3 or higher on three or more AP exams); AP Scholar with Honor (granted to students who receive an average score of at least 3.25 on all AP exams taken and scores of 3 or higher on four or more of these exams); AP Scholar with Distinction (granted to students who receive an average score of at least 3.5 on all AP exams taken and scores of 3 or higher on five or more of these exams); and National AP Scholar (granted to students who receive an average score of at least 4 on all AP exams taken and scores of 4 or higher on eight or more of theses exams). AP Scholars: Brandon Ali, Kevin Beck, Mihail Beja, Grace Beres, Maggie Bunting, Trent Chetelat, Shane Cioccio, Francesca Clubb, Theodore Cooper, Zachary Davis, John Derby, Kevin Diu, Jamey Gannon, Rachel Gillin, Kirsten Graham, Justin Hammond, Megan Hurley, Elsa Jacobsen, Grant Janek, Dori Krasner, Andrew Miller, Amelia Nickell, Anahi Rizo-Sanchez, Kyla Taylor, Logan Townsend, Zoe Watson, Brianna Watts, Parker Wheeler, Brandon Yusuf. AP Scholars with Honors: Andrew Burke, Connor Carpenter, Isabel Emond, Davina Graybill, Shea Griffin, Michael Mareno, Stephanie Marx, Laila Mirza, Patrick Mumford, Faith Murray-Engh, Puntakarn Noparat, Kaitlyn Peters, Abinesh Saravanan. AP Scholars with Distinction: Serena Camilleri, Jamie Ditzel, Justine Graham, Emily Hurley, Dana Kim, Maya Knepp, JaVaughn Marshall, Rachel Prengaman, Jack Reimer, Preston Whittaker. School clubs unite in "Donations for the Troops"
In honor of Veterans Day, four flatbeds of toiletries and other awesome donations were collected for the troops courtesy of Connections, Leo Club, NJROTC, students and staff. During the time of giving, students and staff definitely caught the spirit, collecting over 2000 pounds of canned goods during the annual food drive, November 12 - 16. The school donated the goods to Diakonia, a local shelter in West Ocean City. Student Government Association members sponsored the drive. In the spirit of giving, National Honor Society fundraised throughout December so that the group could adopt needy families through Worcester G.O.L.D. (Giving Other Lives Dignity) and make an annual donation of $3000 to Believe in Tomorrow. Since 2005, the organization has donated over $30,000 to Believe in Tomorrow. 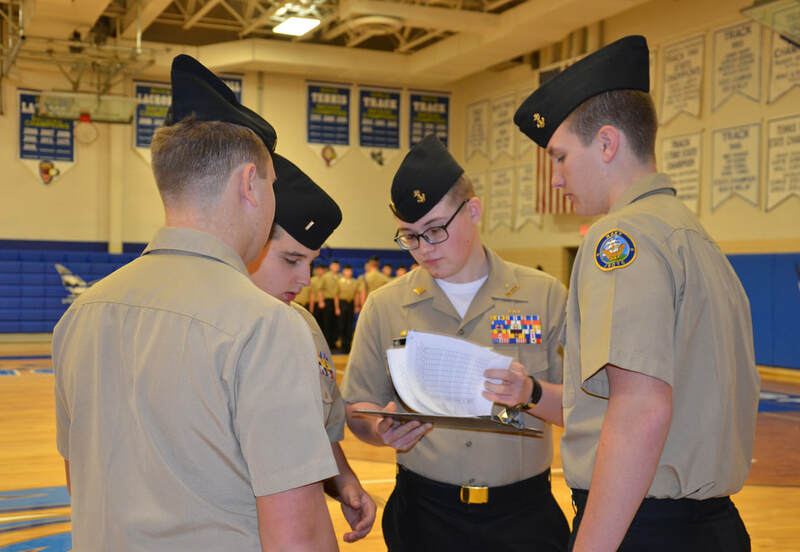 The NJROTC program welcomed a United States Navy Colonel and Top Gun graduate during its annual inspection on January . The event, which combines a formal personnel inspection of uniforms and grooming with an evaluation of the understanding of Navy values, is designed to allow cadets to demonstrate what they have learned as a participant with the program. Planning out what to do with $100,000 may not be a challenge for many teenagers, but planning an investment strategy may not be so easy. However, for sophomores Billy Fisher and Ian Ramnarain, the challenge of investing a virtual $100,000 landed them as State Champions for the Maryland Stock Market Game sponsored by the Maryland Council on Economic Education. The two are enrolled in Consumer and Personal Finance. They are pictured with Principal Tom Sites and Kurt Marx, business teacher and Investment Club advisor. 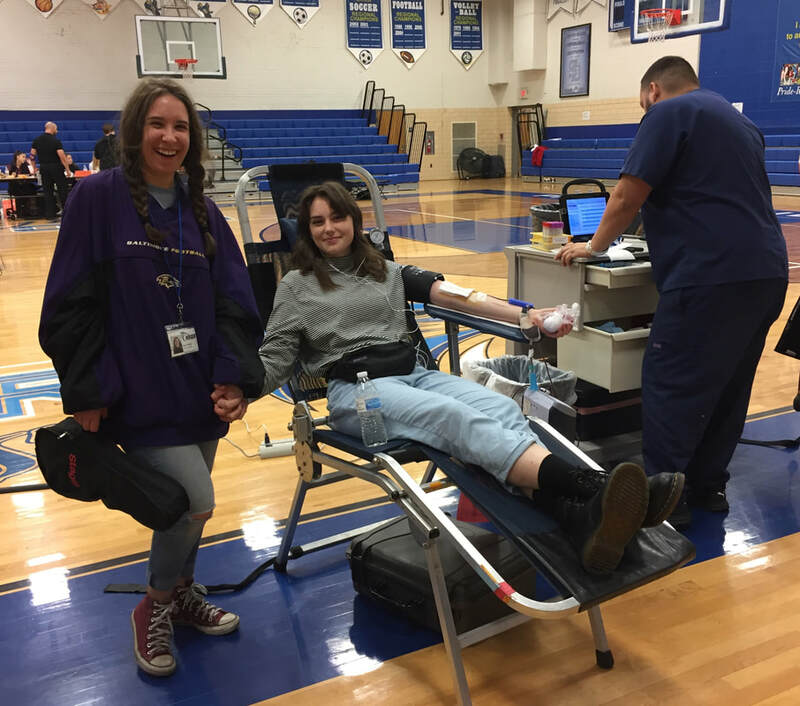 Left: Senior Sarah Beesley gets a helping hand from friend, Tara Fischer, during the bi-annual Key Club/Blood Bank of Delmarva blood drive in November. SDHS is in the running to be recognized as the top donation facility on the Eastern Shore. Right: Key Club helpers Dayton Lantz and Brianna Watts served as assistants throughout the day. Sharing messages of the importance of academics, hard work, and discipline, members of the mens basketball team met with 6th graders at Berlin Intermediate School. Hitting baseballs, then hitting the books. That's what these varsity baseball boys are doing this spring. 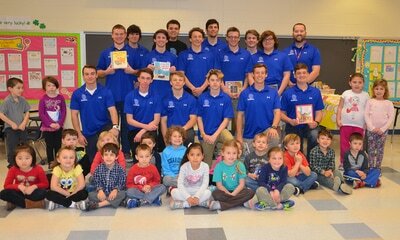 In March, the boys visited students from Ocean City Elementary School and read to them. Center: Brett Berquist shares stories with kindergarteners. 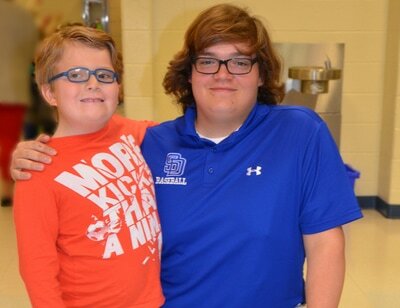 Right: Bryce Messick makes a friend. Thanks to the generous contributions from students and faculty, the Kids Against Animal Abuse and Testing (KAAAT) group was able to donate over 800 pounds of pet food to Worcester County Humane Society and Kenille's Kupboard. A record 109 juniors and seniors were inducted into the National Honor Society in a formal ceremony on April 4th. Students gain admittance into NHS by satisfying the principles of the organization: character, scholarship, leadership, and service. Books, books, and books - oh my! Books, books, and books - oh my! Over 3000 actually. That's what was collected during the National English Honor Society book drive. The group will be sorting and donating to various schools, churches, and businesses throughout the spring. The Decatur Way and those who go above and beyond to demonstrate it were celebrated at the annual STAR (Students Thriving on Achievement and Responsibility) breakfast. Berlin Town Councilman Zack Tyndall (SDHS Class of 2008) served as the guest speaker.